After a few days of finalizing our gear, we are ready to go. If all goes to plan, this evening the SuperTIGER recovery team will be sitting in Amundsen-Scott station at the South Pole. Internet connectivity will be limited there, but I certainly hope to update the blog in some capacity over the coming days. I also hope I won't be suffering the ill effects of being at altitude! 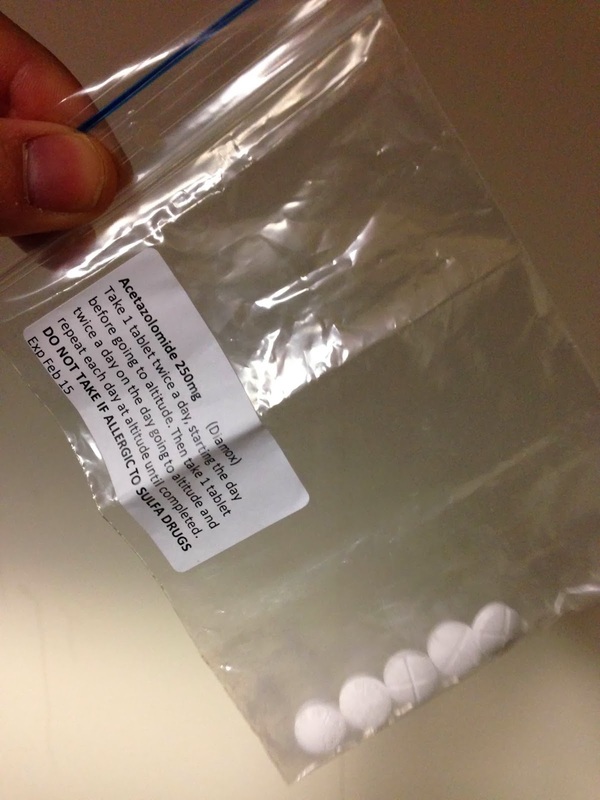 In Christchurch, we were issued "Diamox" (Acetazolamide) tablets which we are supposed to start taking the day before leaving for the Pole, these pills are expected to reduce the probability of getting Acute Mountain Sickness. The South Pole is at an elevation of 9,300 feet (2835 meters) but feels like 11,000 (3350 meters), this can go up to 12, 500 ft (3810 meters) with a low pressure system. The idea being that Barometric pressure decreases at higher latitudes. Flying from McMurdo which is at sea level to those effective altitudes within a 3-hour LC-130 flight will be quite a change to the system, so we need to take things easy upon our arrival. The diamox tablets don't taste the best and can have side effects of making carbonated drinks taste flat (not a killer) and of being a diuretic (more annoying than anything). I noticed fairly quickly after my first pill that I was getting very thirsty, so I've been drinking water steadily since yesterday. In the meantime, life in McMurdo carries on. I've been catching up with old friends from last season and making new friends for this one. Coming back has been interesting because you see quite a few familiar faces but a large amount of new, things are familiar but you can still meet other interesting and fresh characters. I have spent a few nights in one of my favorite places in McMurdo station called the Coffee House. It is one of the original buildings from back in the days when the US Navy ran McMurdo, the building was previously the Officers club. Last season, the Coffee House only sold one thing ... coffee (however you could bring your own alcohol there if you wished). This season however you can now buy bottles of white and red wine if you're feeling classy. The place is a perfect spot for a relaxed night where you can catch up with people, write post-cards or work and sometimes there will be a live music session in the corner (which is really excellent). Otherwise in my free time (which has been limited with all the prep work), I finally got to take a stroll over to another one of my favorite spots in McMurdo, Hut Point. Here is where you will find a shelter (Discovery Hut) built by Robert Falcon Scott way back in 1902. Last year I had the pleasure of getting to tour the inside of the building, still filled with supplies and clothing from the previous occupants on Scott's expedition. 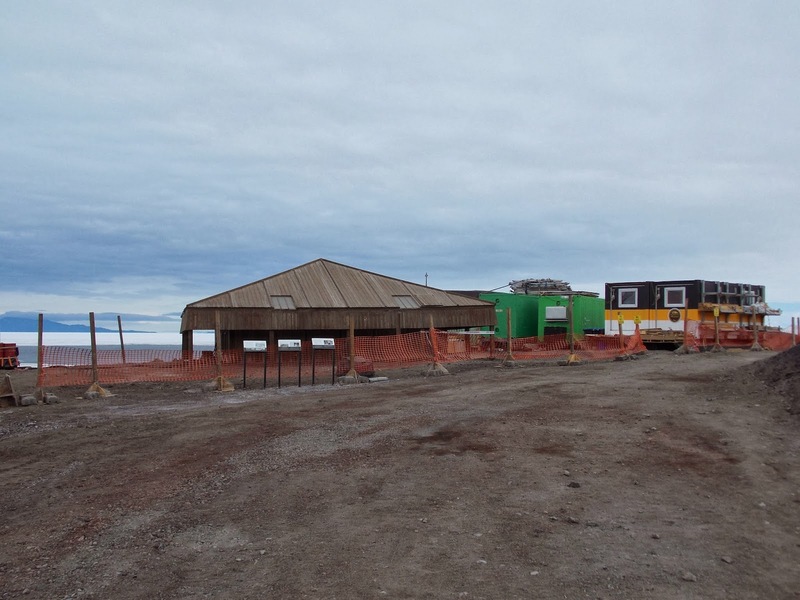 This season the hut is undergoing a preservation scheme to mitigate the effects of over a century of Antarctic weather. This undertaking is managed by the Antarctic Heritage trust, a non-profit operation which aims to protect several historic Antarctic sites. It didn't make for the prettiest of pictures, but preserving the history of those first intrepid explorers for future generations is undoubtedly worth it. 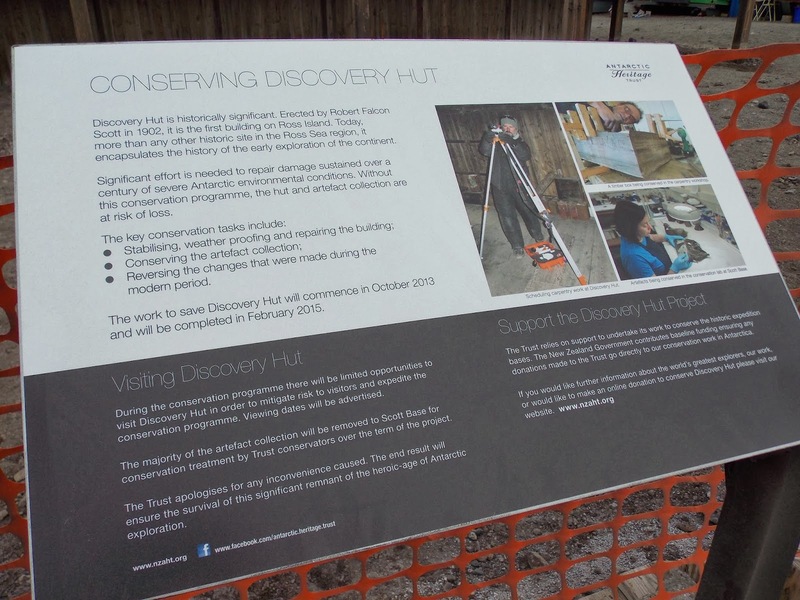 Discovery Hut and the preservation plans. I carried on past Discovery Hut to get a look at the ice-shelf, you can see that it is breaking up nicely. Didn't happen to see any penguins or seals on this trip, but I hope to get out this direction again soon. 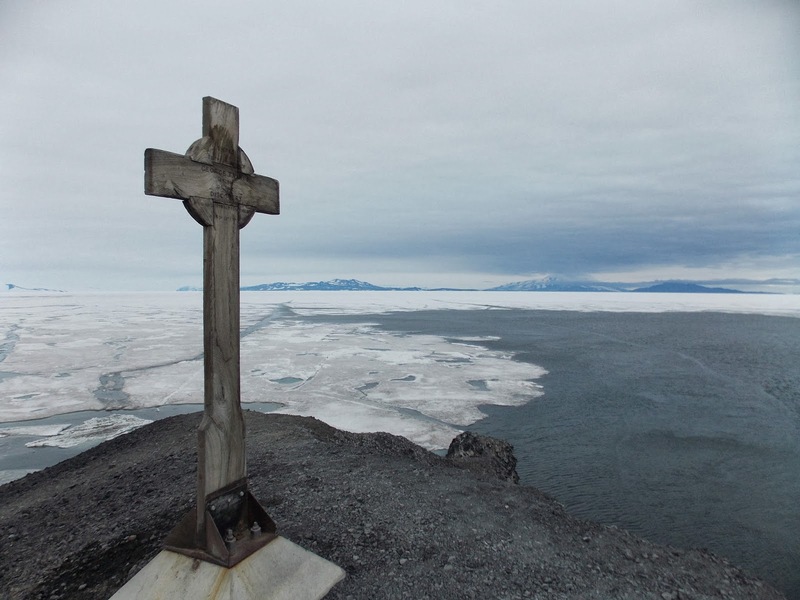 View of McMurdo sound with Vince's Cross, dedicated to Seaman George T. Vince who drowned nearby in 1902. 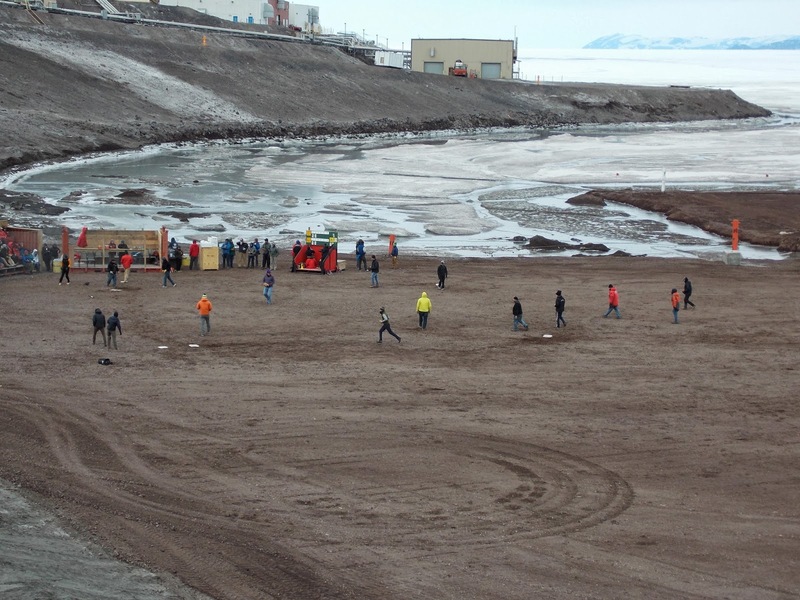 One fairly surreal thing that I saw on my walk to Hut Point was a softball tournament that was taking place at the cargo-staging area by the Ice Pier. This tournament started at 11am and went on until 5pm, the field was complete with bleachers, sausages and beer. I don't think I've ever seen such a heavily dressed group of softball players in my life. Unfortunately with just four SuperTIGER team members (including two Europeans who are more used to kicking things with their feet), it was an unfortunate but sensible idea to not enter a team. 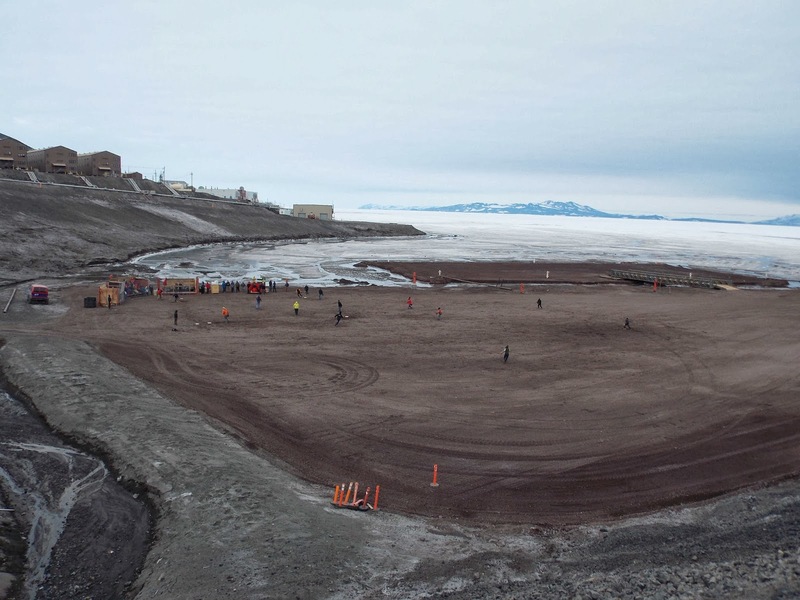 McMurdo Station Softball World-Series Extravaganza (a name I've just made up). Anyway, the adventure continues at the South Pole.